These flexible brush markers contain a dye-based transparent ink that blends easily to create a multitude of hues. 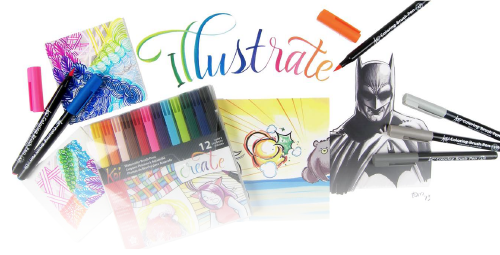 They're great for students, graphic artists, designers, and illustrators. Fine, medium, or bold strokes are easy to achieve, simply by varying the pressure on the brush nib. Use the Blender pen to create seamless washes and color gradations. Koi Coloring Brush Pens are odorless, ideal for those with chemical sensitivities. The ink is not waterproof or fade-resistant.